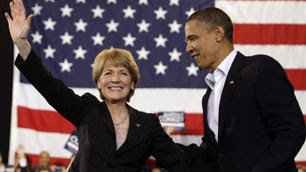 The Next Stage: Women and Retirement: It’s not too late to phone bank for Martha Coakley. Elections are won and lost on Election Day! It’s not too late to phone bank for Martha Coakley. Elections are won and lost on Election Day! I have been obsessing about the Massachusetts senate race for the past few weeks. When I got the email from Obama for America asking for phone-bank volunteers, I saw it as a chance to assuage my anxiety—do some work! If Martha Coakley lost by one vote, I’d hate myself for not doing my part to get out her voters. And then when you’re retired, there’s no excuse. I’ve never liked phone-banking. I did some last week for Planned Parenthood—calling constituents in targeted House districts urging them to call their representatives to make sure the final health care bill did not weaken abortion rights. It was kind of fun using Planned Parenthood’s new state of the art Activate phone bank system, but the responses were not exactly fun. Just about all the folks who picked up the phone were seniors. Many were not very receptive to my message. When I said I was calling from Planned Parenthood several started laughing and said things like, “I’m 77 years old. What in the world does Planned Parenthood have to do with me?” I decided that it was not worth trying to convince them they had a stake in a society in which women have a choice when and if to be a mother. Not sure I accomplished much that day. I’ve always preferred phone-banking for a candidate rather than for issues—-especially if it’s a candidate I really believe in or (like Coakley vs. Brown) a race that’s critically important to a progressive agenda. But no matter how much I care about the race, I’ve never been very good at phone-banking. I noticed that the younger people in the room seemed much more skilled in the art of phone–banking, sounding more natural, looking more engaged, actually seeming to enjoy the experience. I was adequate, but I don’t think anyone would get the impression I was having fun. Any experienced phone bankers out there with some tips to improve my game? I plan to go back today. If I lived in Massachusetts, I’d be knocking on doors. I firmly believe the old adage that elections are won and lost on Election Day. Karen, that's my sister, I am so proud of you. You fight for what you believe in. I have been sick about this election and am filled with anxiety, it helps that you are doing everything you can. Let's hope for a miracle!!! I wouldn’t have been able to do all this were I not retired. I am so depressed about the election results.